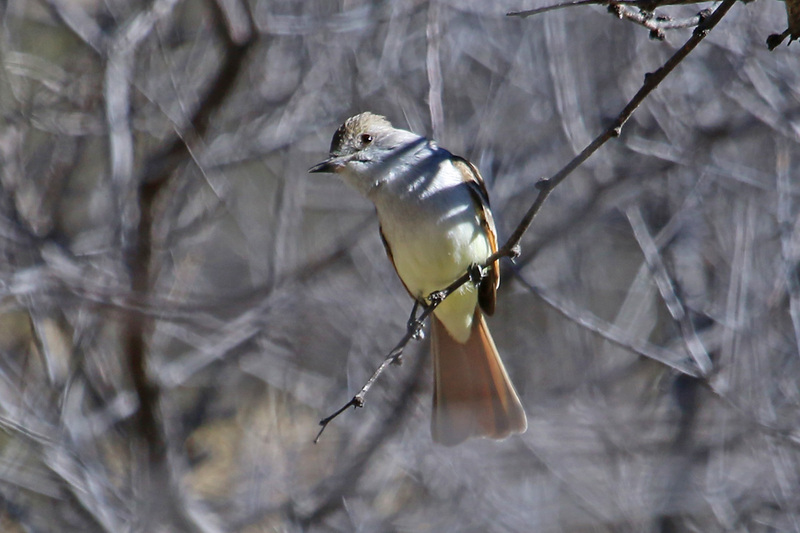 We tried to replicate yesterday’s successful target birding at California Gulch and Tumacacori, with varying results. It took more than three hours, but we eventually found the NUTTING’S FLYCATCHER, in an area we had already searched three times previously. As with my previous sightings, it was always on the move, working the denser sections of habitat and flying across the more open areas. 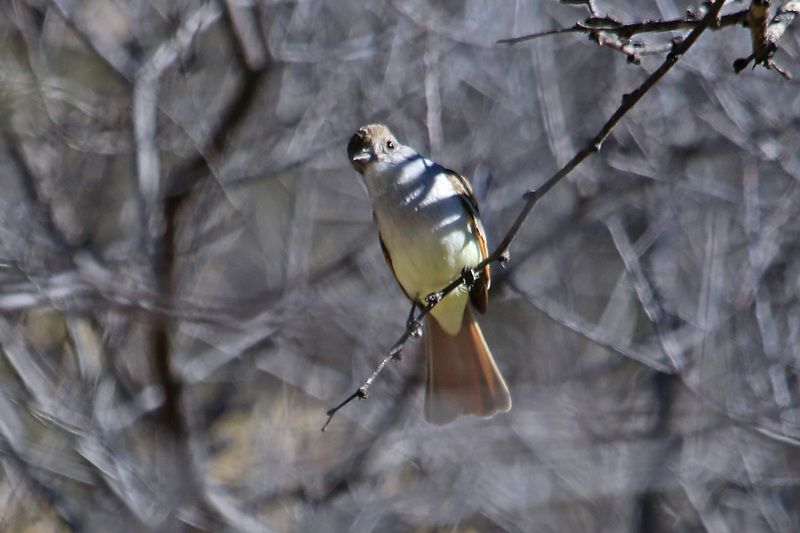 While we searched we also encountered SHARP-SHINNED HAWK, COMMON GROUND-DOVE, GRAY FLYCATCHER, CANYON WREN, BLACK-TAILED GNATCATCHER, HERMIT THRUSH, calling CRISSAL THRASHER, and BLACK-THROATED SPARROW. We devoted the rest of the day to finding a Rose-throated Becard along the Santa Cruz River, but despite our best efforts, we came up empty. We did see a flyover GREAT EGRET, GREATER ROADRUNNER, BRIDLED TITMOUSE, BLUE-GRAY GNATCATCHER, ORANGE-CROWNED WARBLER, GREEN-TAILED and ABERT’S TOWHEES, RUFOUS-WINGED, LARK, SONG and LINCOLN’S SPARROWS, and HEPATIC TANAGER. We also saw a couple of roosting GREAT HORNED OWLS, one of which was being constantly harassed by a pair of COMMON RAVENS, which kept flushing it and chasing it for about 30 minutes. As we headed for the parking lot at dusk, a pair of WESTERN SCREECH-OWLS started up a delightful duet. Another GREAT HORNED OWL was by I-19 to end the day.